People who lose a sense don’t find their other senses actually getting better. Being blind doesn’t make your ears more sensitive and being deaf doesn’t heighten your visual acuity. However, people are very good at adapting to novel situations and the human brain is remarkable in its ability to find new uses for areas that are suddenly finding themselves without a job. If you lose a sense, you may find yourself becoming better at using your remaining senses, but this is due to your brain being efficient and not due to changes to the sensory organs themselves. Contrary to what Silver Age comic book science tells you, ionizing radiation from radioactive compounds is not good for you. If the dose is not high enough to kill you (immediately or over the course of a few agonizing days or weeks), all it will do is damage your DNA. If you’re lucky, nothing bad will come of this. If you’re not so lucky, you may find yourself at a heightened risk of getting cancer or passing along some nasty mutation to your offspring. What is absolutely guaranteed not to happen is the emergence of large-scale enhancements to any part of your anatomy. If we pretend for a moment that having a nasty accident would actually heighten four of your senses, there is no way this could happen the way Stan Lee describes it (which I’m sure must come as a shock to all). It has always been suggested in the Daredevil comic that Matt’s senses are heightened due to changes in his brain. In reality, this wouldn’t be even nearly enough to explain his abilities. The brain can only act on the information presented to it, and the real bottle neck here are the sensory organs themselves. In order to hear better, your inner ear would have to go through some pretty extreme anatomical changes, for enhanced smell the olfactory bulb would have to grow substantially more nerve ending protruding into the nasal cavity, and in order to have more sensitive touch, your skin would have to grow more – and possibly novel – touch receptors. My comments: The sense of smell is perhaps the most underused of Daredevil’s senses, or at least it was until Frank Miller came along. Rather than have Matt recognize people by the way they smell (which is what many animals do), someone came up with the idea of “heartbeat signatures.” The idea of hearing heartbeats is not that crazy, but distinguishing between people on this basis seems like a case of, as we say in Sweden, crossing the river to fetch water. “Smelling people apart” makes perfect sense and is not that much of a stretch of the imagination. Your dog can do it (and so can you, actually), it’s not rocket science. As for the numbers suggested by the MUH, they seem arbitrary to me. If Daredevil can tell twins apart – which he should be able to do – why stop at twenty feet? This shouldn’t be a matter of any fixed distance but by how strong the particular odor is, what other odors are present, whether they are indoor or outside and, in the case of the latter, which way the wind is blowing. The MUH also states that the concentration of an odor has to be 30 parts per million which is quite clearly just a number someone came up with. The concentration required to elicit a response to an odor varies widely depending on the nature of that odor and there are many scents that you and I can detect at concentrations much lower than 30 parts per million. So, what is required for us, Matt Murdock or your dog to be able to smell something? In order to detect a scent, it has to be able to get into your nose. You don’t actually smell the buffet table fifty feet away when you walk into a restaurant. What you smell are the molecules origination from that buffet table that managed to disperse through the air and travel up your nostrils. Not all compounds or molecules are have this tendency to vaporize, that is not all are what chemists call “volatile.” Compounds that don’t vaporize under normal conditions don’t have a smell. Did you know, for instance, that metals have no smell? The smell that we associate with metals comes from the compounds that form when handling metals due to a reaction between the metals and oils from the skin. Getting into the nose is not enough, however. The nerve endings in the back of the nose that you use for the detection of odors are dancing around in a layer of mucus. In order to get to the nerve endings and trigger a response, the molecule in question needs to be water soluble. Some substances dissolve more easily than others and some are insoluble. Up to this point, having a super sense of smell doesn’t help much. If a substance can’t 1) get into your nose and 2) get to where the nerves are, it’s not going to register. However, if you increase the number of nerves and optimize the “smelling environment” (there’s a reason dogs have those big and moist noses) you can shift the threshold so that you need a lower concentration of a particular scent in order to detect it. The so-called olfactory epithelium of dogs is much more densely innervated that that of humans, and much larger as well, and dogs have senses of smell many times better than humans*. Since Matt Murdock doesn’t look like a dog (though he’s occasionally been accused of being one), a more “realistic” assessment for a super-smelling human would be that he might fall somewhere in between. The third step in triggering a response is that the shape of the molecule swimming around in the mucus covering the olfactory epithelium has to find a matching receptor. The nerves in the nose have different kinds of receptors that bind to different kinds of molecules. We have roughly a thousand olfactory receptor genes but only about 350 of them actually work. Still, with only these 350 receptors, most of us are able to distinguish between around 10,000 different smells. The most common theory of how we do this is that most scents are detected by more than one kind of receptor, and that most receptors can detect more than one kind of scent. This would mean that each unique scent would activate a pattern of receptors, which by itself is unique, in the same way we can use only 26 letters to spell out millions of words. My comments: The hearing section of Daredevil’s MUH bio is a complete mess. The normal human hearing threshold is not 20 dB (decibels), but 0 dB – and even a little below that for most people – in the most sensitive frequency range, somewhere between 3,000-4,000 Hz. As for being able to detect a change in sound pressure of 1 dB, this actually describes the average dynamic resolution (i.e. the smallest difference needed to be able to differentiate between sounds differing only in their intensity) of normal humans. Judging by the MUH, Matt actually has a hearing problem, albeit a very mild one. It most certainly doesn’t explain how he can hear the the things he does. 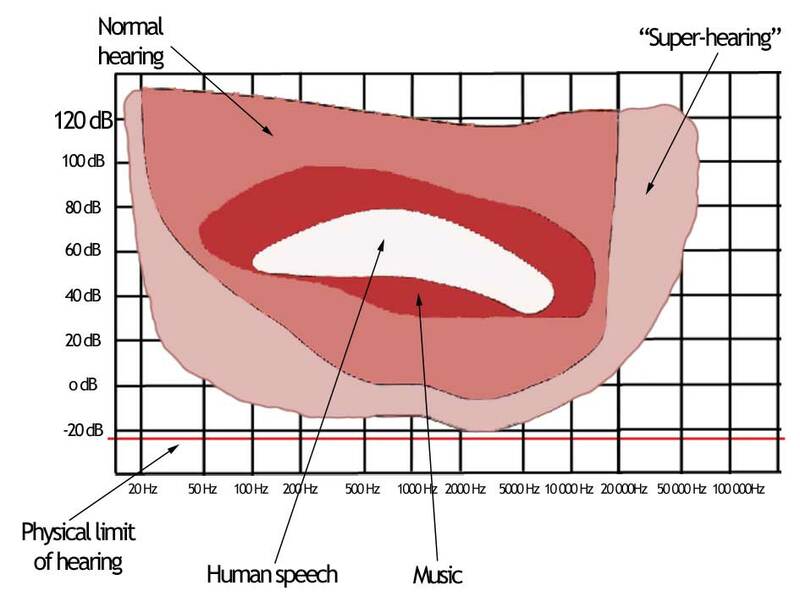 However, rather than just complaining about this, I’m going to help the editors out by actually presenting a model for what super-hearing could theoretically look like. Of course, this would require a huge stretch of human physiology, but it at least abides by the laws of physics. What’s this about the laws of physics, you ask? Well, here’s the thing; there’s a very strict physical limit to sound that no amount of super-hearing can get around. At some point sounds get so faint that they simply cease to exist or at least become irrelevant. It’s sort of like throwing a rock in a pond and watching the rings on the surface spread, only to become smaller and smaller and eventually disappear into the “background noise” of the water itself. Sound is really a pressure disturbance that propagates through the air, setting molecules in motion. But it’s not as if the air molecules are naturally at rest and any motion constitutes a sound. The air molecules actually bounce around randomly due the kinetic energy they have – a phenomenon known as “random thermal motion” – and this can be looked at as a sort of background noise. When air molecules are set in motion by some kind of mechanical disturbance, say hitting a drum, the motion will spread to neighboring molecules as the sound travels away from the source, and the intensity of the sound will gradually decrease the farther away you get. This is due to friction as well as simple geometry. Eventually, you get to a point where the intensity of the sound is so low that the size of the oscillations are no bigger than the random movements of air molecules. At this point, the sound has physically ceased to exist. At room temperature, these movements correspond to a sound pressure level of -23 dB. Keeping this theoretical limit in mind, here’s my own idea of what super-hearing might look like. Geeky, I know. As for what this little model would allow someone to do, you’re going to have to wait until parts 2 and 3 of this little series. In conclusion: The MUH tells us nothing, but physical science does set limits for what biology, even the super-enhanced by radioactivity kind, will allow. However, if we allow for some bending and stretching of normal human anatomy, there are significant gains to be made. I’ll have reason to return to this point when we talk about echolocation (part 2) and just which of Daredevil’s abilities actually pass the laws of physics test (part 3). “Daredevil can also sense the proximity and arrangement of objects about himself. According to one theory, Daredevil’s “radar sense” functions via his brain’s generation of energy within a certain portion of the electromagnetic spectrum. The signal emanates from sending regions of his brains, after which it travels outward, bounces off objects around him, and returns to receiving regions of his brain. Another theory is that this sense functions more closely to sonar in which Daredevil hears the faint echoes of sounds as they bounce off nearby objects. His sense may operate by a combination of these techniques or by other, unknown, means. His “radar sense” varies from the “proximity sense” of Stick and the Chaste, which is more of a mystical discipline. In any event, via this ability, Daredevil synthesizes a very close analogue of three-dimensional human sight. Its resolution is not very fine, probably on the order of several feet at a distance of one hundred feet. By repositioning his head and adding input from his other senses, Daredevil is able to resolve the image of an average flagpole (three inch cylinder) at a distance of over 80 feet. My comments: This passage sums up pretty well what I’ve tried to demonstrate in my A history of the radar sense series; that is, no one knows what it’s supposed to be and most writers seem to picture it in different ways. The old idea of the radar being an actual radar is still out there, but as I’ll argue in my next post, it doesn’t need to be. What I find interesting about this passage, however, is that it tries to quantify the accuracy of the radar sense, and where there are numbers, there’s an answer to be had. I won’t actually show you the math here, but being able to just barely discern an object three inches wide at, say 85 feet translates into a visual acuity of slightly worse than 20/100 or just below one fifth of normal acuity. The suggestion that this feat is accomplished partly by inference after relying on his other senses, and the mention of “its resolution is not very fine, probably on the order of several feet at a distance of one hundred feet” suggests that 20/100 might actually be optimistic. Of course, as with every other number mentioned in the MUH, this one is probably just something the writer came up with on the spot. The. question is: Is it reasonable? While keeping in mind that we’re dealing with a fictional sense that no one has clearly defined and which has been interpreted in a myriad of ways by both writers and artists, I’d say that it does make some kind of sense. The definition of legal blindness is an acuity of 20/200 or worse, but the idea that Matt may not “see” much better than this is not as preposterous as it might sound. Dogs see no better than 20/70 and cats do even worse with estimates ranging from 20/100 to 20/200 (i.e. one fifth to one tenth of human visual acuity). Cats, whether big or small, are known to be skilled hunters and capable of daring, but precise, leaps and bounds (though my own cat is completely worthless in these regards) so it’s quite obvious that seeing the world in a relative blur may not be a problem so long as the ability to judge distance is preserved. Most artist, when attempting to recreate the radar experience on the page, tend to draw it as slightly blurred and ill-defined and few writers have suggested that the radar sense rivals human sight when it comes to visual acuity. In the case of Matt Murdock, he can’t read at a distance anyway, nor can he “see” the kind of detail that people normally utilize color perception for, so there really wouldn’t be that much to gain from “seeing” better. Since everything is only one color, he’d still be more dependent than you or me on his other senses regardless of how sharp that one-color experience is. Much remains to be said about these topics, but it makes more sense to deal with them in post number 3, so I will have the opportunity to return to the burning questions of whether you actually can count the number of grains of salt on a pretzel and whether reading print by touch is actually physically plausible. We’ll also look at what having heightened senses might be able to do for your fighting skills. If you’ve made it this far, reward yourself with a stiff drink and join me back here for part 2. *) Note: In recent years, more and more research is indicating that humans have a much better sense of smell than previously thought, and that dogs and other mammals are not as superior as was once believed. In terms of the scent threshold for many substances, humans can in fact rival dogs. However, there seems to be a deficit in human awareness of scent that I will have reason to return to. Made it this far? I was disappointed I have to wait until the next part. My comments? “There is no way this could happen the way Stan Lee describes it (which I’m sure must come as a shock to all).” Say it isn’t so! ;] Yeah, you usually can tell a Stan created character from a non-Stan character by whether or not radiation had something to do with their gaining powers. His ideas were very much a product of the times I’d say. The more I think about it the more I think his radar sense can be interpreted as an adaptation (rather than a mutation in his brain). He is constantly getting heightened sensory information from his enhanced hearing, touch (through vibrations caused by movement around him for instance), and smell, that his mind pieces together all of that and forms the omnidirectional “image” in his mind. It is simply how he has learned to make sense of all the information he gets about the world around him, instead of his brain having “sending” and “receiving” regions for electromagnetic energy. It could also explain how some really strong smell, or sound, or whatever can disorient him despite having a radar sense because his radar sense isn’t separate from his other senses but rather dependant on them.. Maybe I am rambling, but does that make sense to anyone? This post is AWESOME. So fascinating. I didn’t know metal had no smell! So that “metallic odor” people always talk about it is actually a LIE. Looking forward to the next two parts. Especially whether Matt can really taste all the grains of salt on a pretzel. Because COME ON. Fascinating stuff, Christine. I love it! I can’t wait for the next two installments. @Andrew – I (and I think Christine as well) endorse the view you seem to be taking of DD’s radar sense, i.e., that is simply a composite of his four heightened senses. The more modern takes on DD seem to follow suit, speaking less about an explicit radar sense and more about his individual senses, though there are exceptions. Great article Christine! I always enjoy your entries, but I wanted to mention it in this one in specific because it sounds like a lot of work, and I wanted to make sure that you finish the series, haha. Seriously though, my brain may not be much for SCIENCE! but you made it pretty clear and easy to understand. This was great work. Very well done, well researched, and logical. When I think of DD radar, it’s as pressure variations, along with a combination of Matt’s other senses. The idea in “Man Without Fear” by Miller when Stick has Matt feels the air. The idea of “random thermal motion,” though you apply it aptly to hearing, would account for a radar impression if Matt were sensitive enough to pick up disturbances in the pattern (and why not?). It would also account, in part, for Matt’s borderline precognizant behavior is combat. My question has always been about balance (though I resolved it for myself a long time ago). If Matt’s hearing were mutated, would his inner ear not also be enhanced, thus giving him (along with his sense of touch) superhuman balance? The line “Things just seem to come easer for me now,” from issue one supports this, as does his running across tight rope and doing weird acrobatic feats. It’s never implicitly stated. Maybe it’s just his senses allowing him the ability to read his own body position. I would love to here what the community thinks. I’ve always thought that about his sense of balance as well (it is a “sense” after all), and I think I recall reading in an interview somewhere a writer thinking the same thing (since sense of balance is controlled largely, although not solely, by the vestibular system of the ears). Hey guys! Lots of ideas flying around here, at least some of which I’d been planning on getting to in one of the later posts, such as the senses of balance and proprioception (our “inner” sense of touch that creates body awareness). These certainly help explain DD’s skill level and I’ve always taken it for granted that they are heightened along with the rest of his senses. In it, they talk about how the sense of smell actually works which mirrored the post above. They also made a car run on coffee beans, but I didn’t have any DD-related scoops on that. Just letting everyone know that I will get to my echolocation post tomorrow. My best friend, who’s pregnant with her first baby, went into labor a few hours ago, prompting me to get back to knitting the baby sweater I was working on. That’s a good excuse, right? That is a capital excuse. Congrats to your friend! Make sure she names the baby Matt. If it’s a girl, Elektra. I agree with Andrew. Congrats. Enjoy this time with your friend (my wife and I have a baby on the way and were very excited). And thanks guys for the positive reinforcement about balance. There is little better fuel to “geek out” on that the MUHBs, but from the point they started putting powers and abilities on a grid I’ve felt they have missed something core about DD that makes him formidable. I enjoy the MUH, but the numbers it assigns for characteristics like “Strength”, “Fighting Skills”, and “Speed” are borderline absurd between characters. It’s really disappointing that a potentially geek-tastic resource is so inconsistently maintained. According to the “official stats” at Marvel.com/universe, on a scale from 1-7, Daredevil has a strength of 2 and a speed of 3. That seems fine. Those values make sense for Olympic-level humans in the superhero universe. Captain America (Steve Rogers) is strength 3, speed 2. Wolverine is strength 4 and speed 3. And then there’s Elektra with her strength of 4 and a speed of 6. Elektra’s as fast as Thor and Thanos, and is faster than Iron Man and Nova (both 5s) who can fly fast enough to escape orbit. Something’s a little off here! For the record, those with a 7 in speed include Silver Surfer, Galactus, Quicksilver, and the Hulk(?). And let me not forget to mention that Professor Xavier is strength 4, speed 2! I know he’s out of the wheelchair now, but come on! 🙂 I could keep going on – Intelligence is a hoot! – but I think I’ve veered away from Daredevil too far as is. Yeah, the power grid is weird, but I do like how someone like Ben Urich is described as – and I’m paraphrasing now – “fit for a chain-smoker of his age.” 😀 I wrote a post about weird things from the MUH a while back about this. Hi everyone who has subscribed to comment updates for this post! Because you did do that at the time you left your comment, right? Anyway, I’ve been going through all of my science-related posts recently in preparation for the massive Daredevil Science ebook I’m putting together over the next few months. With this post, I found a couple of things that needed to be updated in view of new available research on scent. I will probably write a separate post on these advances in the near future, but just wanted to point out what now appears to be an error in this post (see the asterisk at the bottom of the page and the section it references).